Submissions for the 2019 CAPACOA Conference Showcases are now open! 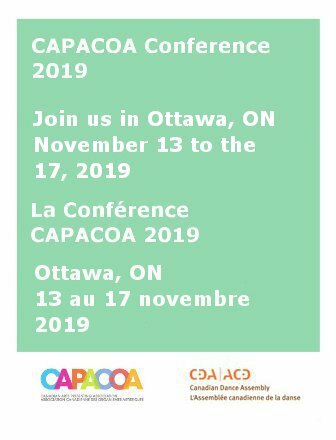 Submissions for the 2019 CAPACOA Conference taking place November 13 to the 17, 2019 in Ottawa, ON are now open. CAPACOA welcomes applications from all disciplines of performing arts from around the world. The deadline to apply is Monday, April 29, 2019 at 5:00 pm EST. We are accepting applications through the I Want to Showcase platform; a multi-conference registration site allowing artists to apply to several contact events across North America in one convenient place. Applicants must complete all parts of the online showcase application and submit payment (online via PayPal). All showcase applications must be submitted online, with completed payment, no later than Monday, April 29, 2019 at 5:00 pm EST. All accepted applicants must purchase one full delegate registration and an exhibitor table, and, as an Exhibitor Delegate, you must supply a representative (manager or otherwise) during all open Exhibit Hall hours. Complete and return the showcase contract and technical production form. Be available to perform in Ottawa, ON from the evening of Wednesday November, 13 to the evening of Saturday, November 16, 2019. We will do our best to accommodate schedules but be prepared to perform on one of these four days. Please reserve all three days of the conference on your calendar until the final showcase and tech schedule has been released. It is possible that you will need to tech the day before your showcase. CAPACOA assumes no responsibility for costs associated with showcasing or pitching including travel and accommodations. If a selected act is unable to appear, no substitutions will be permitted for its showcase performance or pitch. The selection committee will establish a list of alternates from the original applications based on the next highest score achieved. Cancellation by an agent or promoter does not guarantee that agent or promoter the opportunity to fill the vacant showcase. Participate in scheduled sound check/rehearsal the day of performance. CAPACOA will provide full schedule and sound check details closer to the event.